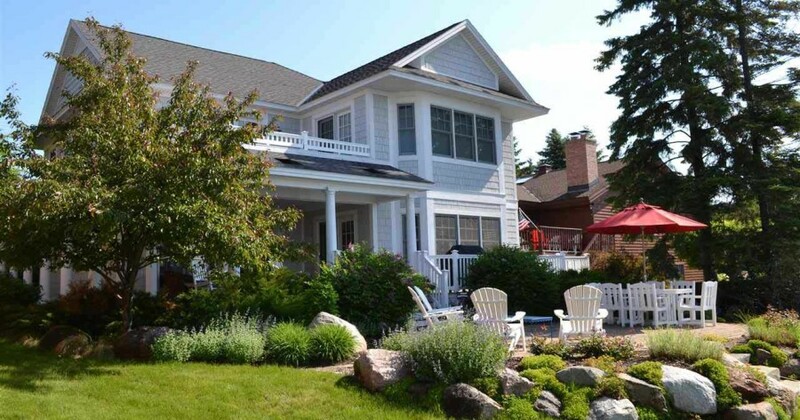 This Boyne City waterfront home has the makings of an Up North happily ever after with sandy frontage and a beautifully landscaped and low-maintenance yard looking out on Lake Charlevoix. The bright and spacious interior of the home is just as charming with 5 bedrooms and 5 and a half bathrooms, a gorgeous kitchen, dining room and living room. Two of the upper level bedrooms both have decks that soak up lake views. Additional amenities include a walk-in pantry, two gas fireplaces and a guest area over the garage with two full bedrooms and a shared bath. This Boyne City home is listed by Pat O’Brien of Pat O’Brien & Associates. He can be reached by calling: 231.582.1767 or 231.582.1700 or by email: pat@patobrien.com.